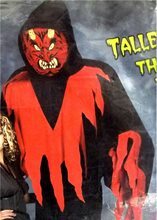 Devil Man Adult Vest.Includes: One Devil Man Adult Vest. Available Size: One Size Fits Most Adults and Teens. *Costume and Accessories Not Included. Sold Separately. 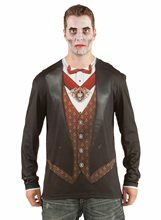 My, what a handsome devil you will be when you wear this Handsome Devil Costume. 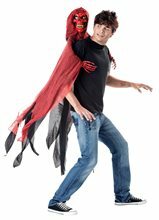 This is no cheap imitation, but an actual authentic looking outfit that suits your devil may care attitude.You'll look magnificent as you stride into any Halloween party, or other adult themed event. 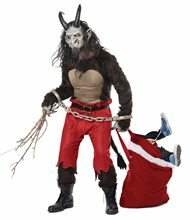 What a grand entrance it will be if you accompany your lady dressed as Devil's Temptress Adult Costume (sold separately). Red Hooded Adult Cape.Includes: One Hooded Adult Cape.Available Size: One Size Fits Most Adults and Teens. 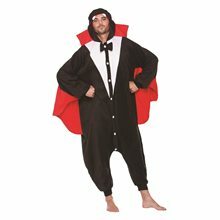 *Costume, Stockings, Makeup and Shoes Not Included.Hooded Cape is 74" long. It's a great costume accessory for vampires, witches, and a variety of other gothic Halloween costumes. Also great for masquerade and Mardi Gras costumes.